A database server should be able to service requests from a large number of concurrent users. When a database server is servicing requests from many clients, there is a strong possibility that conflicts will occur because different processes request access to the same resources at the same time. A conflict in which one process is waiting for another to release a resource is called a block. A blocked process usually resolves itself when the first process releases the resource. Deadlocks can also occur if the resources are not acquired in some well-defined order because if all concurrent transactions access objects in the same order, deadlocks are less likely to occur. 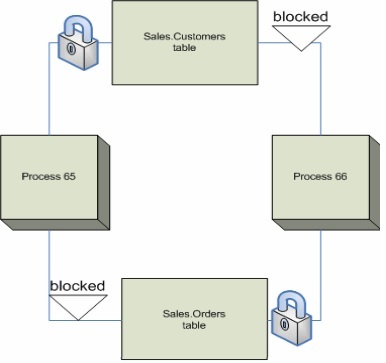 For example, if two concurrent transactions obtain a lock on the Department table and then on the Sales table, one transaction is blocked on the Department table until the other transaction is completed. After the first transaction commits or rolls back, the second continues, and a deadlock does not occur. Using stored procedures for all data modifications can standardize the order of accessing objects. Also define some programming policy that defines the order in which database objects can be accessed. As long as all programmers in the project know and apply the policy of acquiring the lock in well-defined order, you will avoid deadlock. For hopefully obvious reasons, we must release locks in the opposite order to that in which we acquired them, and should release them in a finally clause of TRY/CATCH block. Properly analyse the situation and ensure that all resources within your code are acquired in some well-defined order. Deadlocks typically occurs when several long-running transaction execute concurrently. Keep transactions as short as possible because when several long-running transactions execute simultaneously against the same database then there is more chance of deadlocks to occur as a result of these transaction because exclusive or update locks are held longer for longer transactions which blocks other activities which leads to possible deadlock situations. Keeping the transaction in one batch minimizes network roundtrips during a transaction, reducing possible delays in completing the transaction and releasing locks. Use bound connections because two or more connections opened by the same application can cooperate with each other. Any locks acquired by the secondary connections are held as if they were acquired by the primary connection, and vice versa. Therefore they do not block each other. If your database has a large number of deadlocks because of writers blocking readers and/or readers blocking writers, and you can’t have a separate copy of the data for reporting purposes, using row versioning (available in SQL Server 2005 and later) provides the advantages of being able to read and write at the same time without side effects of NOLOCK or READ UNCOMMITTED. I agree we should not use NOLOCK but there are situations where we can use NOLOCK for example: If you have a bunch of large tables, these tables only store the historical data for clients. If these tables will only going to be updated as part of overnight batch process but these tables will be queried frequently during the day then in this situation using NOLOCK will be a better option against using row versioning. My post clearly suggest to carefully consider your situation before using NOLOCK hint. dumb question… why dont SQL servers have an option to delay the response for the deadlock victim and restart the transaction when the resource became available. Do this as many times possible until success or timeout.